It’s the season for all things “appetizer”, am I right? We’re talking football games, baseball world series, and holiday parties galore. 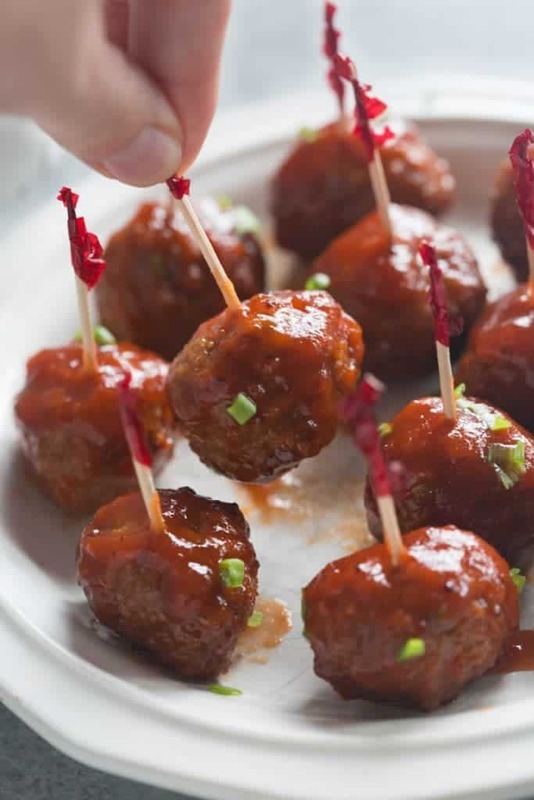 And if there’s one thing I’ve noticed, the little bite size appetizers, like these Cranberry BBQ Meatballs, always get devoured the fastest. 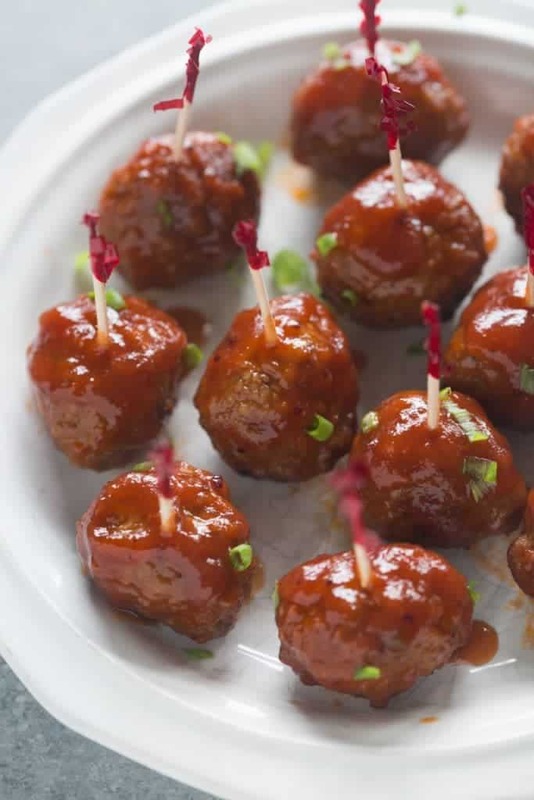 It doesn’t matter how old you are, or how picky you are, EVERYONE loves a yummy little meatball appetizer. The best part about this recipe is you can make it as simple as you want. 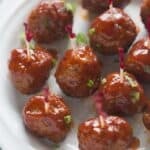 You can use store bought, frozen meatballs–I really like the Costco brand of frozen meatballs–or you can make your own meatballs from scratch. If you’re super organized, you can make homemade meatballs, freeze a bunch of them, and use those whenever you’re in a pinch and decide to make this quick and easy appetizer. 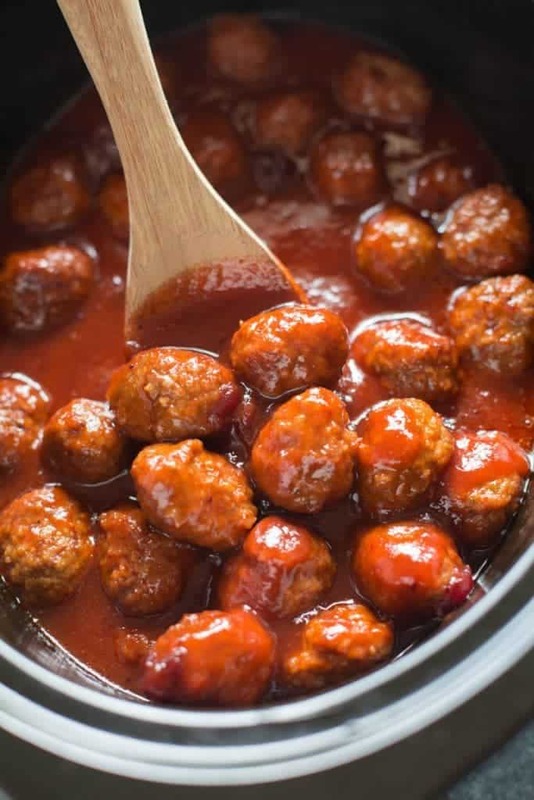 Add your frozen meatballs to the slow cooker. In a separate bowl, mix cranberry sauce, cocktail sauce, brown sugar, water, and bbq sauce. Pour this mixture on top of the slow cooker meatballs and and cook on low for 4-6 hours. Are Frozen meatballs already cooked? I love Costco’s Kirkland signature meatballs and these meatballs are already precooked! Frozen meatballs are so convenient because you don’t have to let them thaw. You can cook them on low for 5-6 hours or on high for 2-3 hours! And, you cook the meatballs right in the sauce! It doesn’t get easier than that! 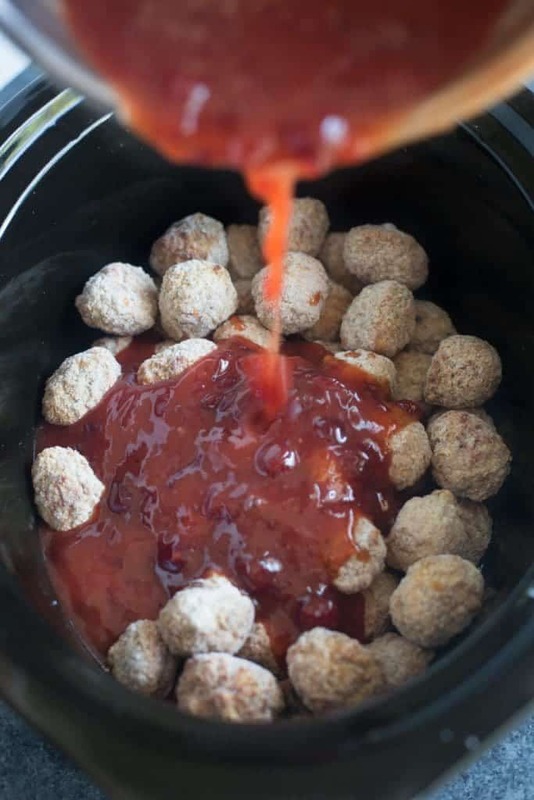 In a large bowl stir together cranberry sauce, cocktail sauce, brown sugar, water, and barbecue sauce and pour over meatballs. Add ingredients for the sauce to a saucepan and stir until smooth. Then add the meatballs and stir to coat. Bring to a boil, then reduce heat to simmer. Cook for 8-10 minutes for thawed meatballs, or 14-16 minutes for frozen meatballs. Nutritional label is based off of one serving = 4 meatballs. These were sooo good! I made them for a potluck and they were gone by the end of it. I used frozen turkey meatballs and they turned out great in the crock pot. This will be my go-to potluck meal from now on! Sure, that should be fine!